We can’t imagine our daily life without tropical fruits and mango is leading the list. It is one of the most delicious, flavored and healthful fruits that we have ever met. This nutritionally rich fruit has very unique flavor and taste, added its health promoting features. This super fruit has many sizes and shapes and it depends on the cultivar types. In general, it has juicy flesh, orange-yellow peel with a lot of fibrils. Any of these fruits having high-quality shouldn’t have any fiber composition and tartness. Its seed should be either single or poly-embryonic. Prepackaged in yellow jackets bananas are amazingly sweet and have creamy and firm flesh. They are available for harvest all year long. Its plant height varies from 10 to 26 feet and is from Musaceae family. Each cluster of this fruit contains approximately 50-150 fruits divided in bunches often called “hands”. It is supposed that this fruit has originated in Malaysia for almost 4 thousand years ago. Afterwards, they spread throughout the Philippines and India and were recorded by Alexander the Great’s army. At first sight, bananas seem flexible, but in reality they are very fragile and require good care. Unripe fruits of this plant should be left in room temperature to ripen, as overheating and cold stop the ripening process. Mango fruit is a good source of vitamins and contains slightly more vitamins than banana. This fruit contains 4 and 17 times more Vitamin C and A compared to the second fruit, whereas the latter is two times higher in Vitamin B2 and B5. This fruit is a good source of potassium, whereas mango contains two times less of it. This element is vital for cell and body fluids that are required for heart rate and blood pressure. From the standpoint of carbohydrates and proteins banana is significantly richer. The yellow-dressed fruit is also higher in calories and each 100gr contains almost 90 calories in contrast to 60 calories of the other fruit. This fruit is also richer in minerals for more than two times. On the other hand, the other fruit is richer in vitamins and it is a good source of Vitamin B6 and its amount is radically higher than in banana (app. 3 times). The latter also contains sugars like fructose and sucrose that are useful for revitalizing the body and replenishing energy. That is why it is widely consumed by athletes as a source of good energy. It is also irreplaceable for under-nourished children in the plan of treatment. According to a recent research study, mango is able to protect from breast and colon cancer, leukemia and prostate cancer due to the considerable amount of polyphenolic antioxidant compounds. For maintaining healthy mucosa and skin you had better consume more mangos as they contain a lot of Vitamin A which is responsible for the proper action of your body. It is believed that consumption of fruits high in carotenes will protect from oral cavity and lung cancers, and this fruit is one of them. Infectious elements will stay away if you use more fruits and vegetables high in Vitamin C and mango is a huge source of it. Banana is a great source of Vitamin B6 and its 100gr provides almost 28% of daily required amount of the vitamin. In general, pyridoxine is an important B-complex vitamin that is essential for the treatment of anemia and neuritis. You will get a considerable amount of minerals like copper, magnesium and manganese by eating this fruit during the day. Magnesium is perfect for bone strength and plays a great role for the protection of cardio-vascular system. Thus, concluding, it stays to add that mango and banana are important for the proper function of our body. 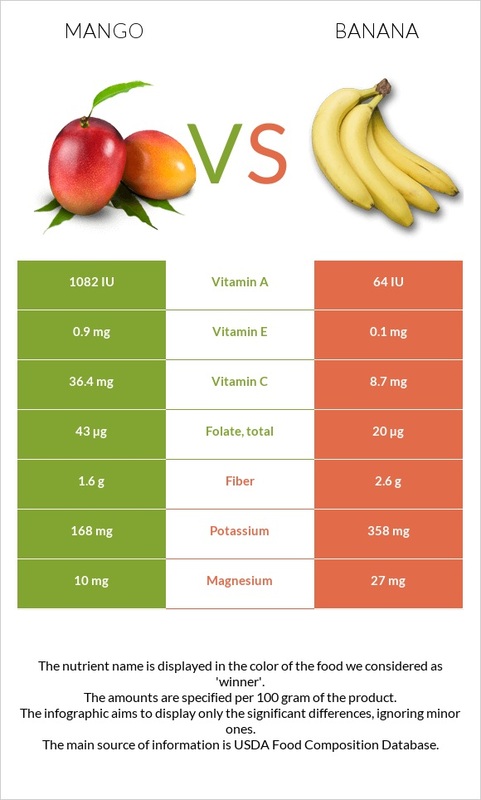 Nevertheless, banana is radically higher in minerals and wins mango with a score of 5/2. From the other hand, mango contains more vitamins putting it higher in the useful fruits. Taking into account the studies carried out it should be mentioned that mango is more useful from the viewpoint of protection against many cancer types.